Meigs senior Zach Bartrum attempts to avoid a group of RVHS defenders during Friday Night’s Tri Valley Conference Ohio Division contest in Rocksprings, Ohio. 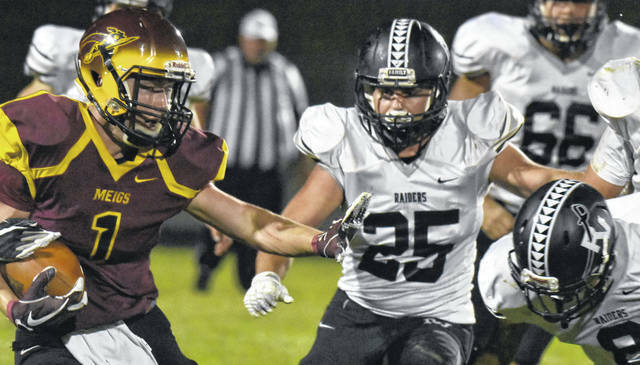 ROCKSPRINGS, Ohio — Despite the delay, the Marauders and Raiders played. The Meigs and River Valley football team battled the elements prior to the start of their Tri Valley Conference Ohio Division contest on Friday night, with lightning pushing the kickoff back nearly two hours, but once play began the Maroon and Gold utilized a 28-point third quarter to flash past the Silver and Black en route to a 42-21 victory in Meigs County. The Marauders (2-3, 2-0 TVC Ohio) provided the only points in the game’s first quarter, as Cole Adams propelled the hosts to a 7-0 lead with 70-yard punt return at the 7:49 mark. MHS extended its advantage to 14-0 at the 9:18 mark of the second period, as Coulter Cleland connected with Weston Baer on an 11-yard pass. River Valley (0-5, 0-2) cut the deficit to seven points 4:28 later, as Cole Young’s two-yard touchdown narrowed the margin to 14-7. Following the intermission, Meigs grabbed the game’s momentum, scoring 28 points in the third quarter, beginning with a 42-yard touchdown run by Zach Bartrum at the 9:55 mark. Bartrum added a second touchdown with 5:14 remaining in the period, when he pulled in a 23-yard pass from Cleland. Ty Bartrum continued the Marauders scoring production, when he returned an interception 43 yards to extend the hosts advantage to 35-7 with 4:03 remaining in the third. Zach Bartrum punched in the Maroon and Gold’s final touchdown of the contest a mere 1:45 later, as he scampered for 15 yards to push the lead to 42-7. 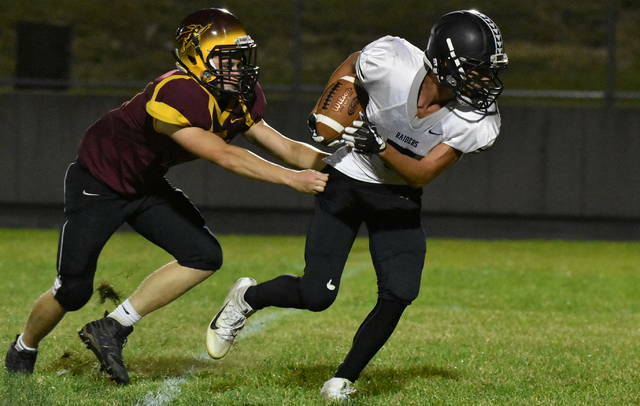 River Valley accounted for all of the scoring in the finale, as Trevor Simpson carried a two-yard touchdown into the end zone with 3:22 remaining in the contest and Dylan Lemley scampered for a 12-yard run to close the deficit to 42-21 with just 11 seconds left in the game. In the 21-point victory, Meigs’ chalked up 312 total yards, while RVHS finished with 210. MHS had a slight 11-to-10 advantage in first downs, but lost the turnover battle by a 3-2 count. Zach Bartrum led the way for Meigs with 96 yard rushing, while Cole Adams followed with 57 yards. Cleland finished with 10-of-16 passing performance for 127 yards, including two touchdowns. Trevor Simpson paced the Raiders on the ground with 117 yards rushing, while Jared Reese was next with 24 yards. Jordan Burns completed 5-of-11 passing for 63 yards, as Reese made three catches for 45 yards. Both teams return to the gridiron on Friday, as Meigs travels for a road date with Nelsonville-York, while River Valley hosts Wellston.